Krista Knight and longtime musical collaborator Barry Brinegar (a.k.a. David Spegasus), under the aegis of The Cradle Theatre Company, have put the punk back in myth. Their new show Hissifit is literally an underground sensation. To see the show, go to the DownUndertheManhattanBridgeOverpass section of Broooklyn, descend into the basement of 65 Pearl Street, and follow an undulating course of glow tape to the music rehearsal space where you will stand, clap and dance during the performance. Krista Knight, doing an impeccable job of embodying a rainbow, introduces the band Hissifit, which is made up of three gorgon sister riot grrrls: Medusa (Julia Rose Duray), Miku (Andrea Negrete) and Macy (Vanessa Pareda-Felix), who regale us with energetic tachyons, or however the ancients described independent music. The snake-ish band has their own DIY aesthetic, with paint-on scales (such that the nerd in me would call “Deep Space Nine Fabulous”) and have been known to bite disrespectful fans. These “fem monsters” have no money, so they consider a contract with British sassypants record exec Scott Rodent (Justin Pietropaolo). Suddenly, they are attracting large crowds, even the young-at-heart goddesses Athena (Rachel Caplan) and Aphrodite (Katharine Chin). Knight and Brinegar have really tapped into the power of these myths. Athena and Aphrodite are youngish Olympians (having sprung fully-formed from the testicles of Uranus and the mind of Zeus, respectively) and here are a bunch of screaming, privileged groupies. It’s a good thing that Athena and Aphrodite are waiting outside the band’s dressing room after the show, as the sea god Poseidon (Preston Mulligan) appears, ready to violate the strong, beautiful Medusa. Instead, Athena and Aphrodite repel Poseidon and give Medusa her infamous power to turn those she gazes on to stone. This feminist empowerment straight from Olympus is a welcome update from the story found in Ovid’s “Metamorphoses”. Even the young goddesses wander away from Medusa acting “stoned”. Well, now Hissifit is causing a sensation as Medusa turns various fans to stone. Scott Rodent seeks to diffuse the situation by turning young Perseus (Nicholas Leung) into a hero. Perseus, a mere mortal, son of absentee father Zeus, has no friends, spends his free time playing rock video games, and “is somewhere on the spectrum”. He is probably the youngest character, and he shows it in good and bad ways. Great writing all around! Perseus, a wearer of many safety pins, a dude who never looks anyone in the eye and a holder of a reflective shield, gives Medusa sunglasses which will allow her to safely play more concerts. Medusa rescues Miku and Macy from the Humane Society, where the idea of euthanasia hangs over their heads. They are mistaken; the term doers not refer to a band with young fans in Asia. Eventually, Medusa’s megalomaniac tendencies kick in. 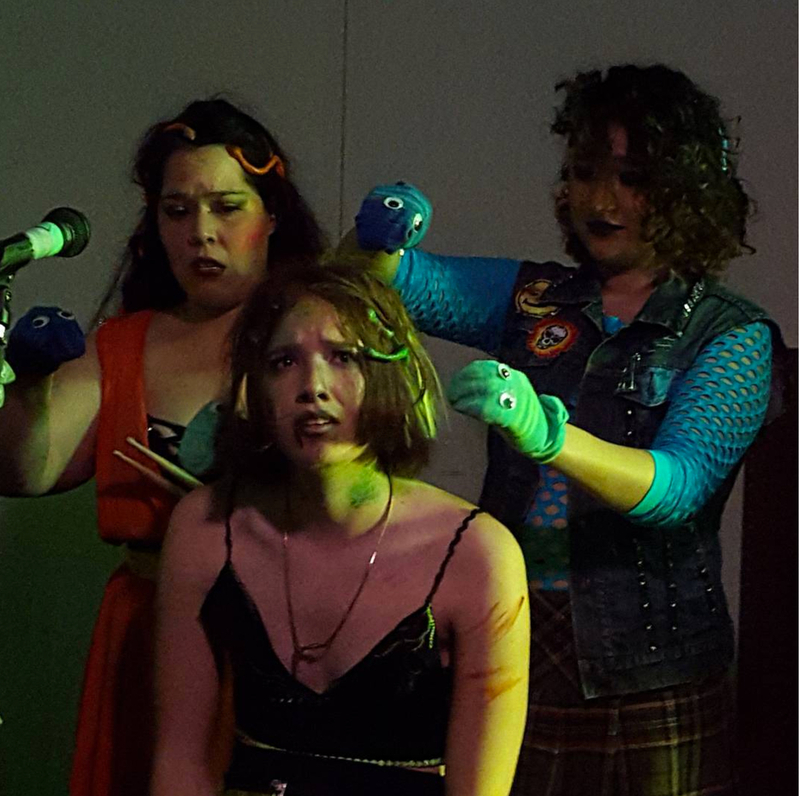 She talks to the snakes in her hair (which are sock puppets operated by Andrea Negrete and Vanessa Pareda-Felix) and gradually turns evil. But nothing happens the way you might expect. The performers constantly enter and exit from different corners of the room, and the audience must turn every few minutes to readjust. Barry Brinegar’s video projections add legions of loyal fans, most with snakes in their hair. Pegasus the flying horse also makes an appearance. Rebecca Etzine's direction brings together a non-stop punk rock show and a multimedia spectacle, circa the year "MCMLXXVI". Brooklyn lives: I'd say that was the most fun I've had in that neighborhood in 15 years. Jenni Oughton costumes the band in green skirts, fishnets and other monstrous effects. Also noteworthy is Poseidon's trident formed out of safety pins on the back of the god's jacket. Julia Rose Duray as Medusa valiantly makes a case for Medusa as an uncompromising, sexually charged woman who deserves the help (not the punishment) of the gods. Her sisters, Andrea Negrete and Vanessa Pereda-Felix, are so full of energy they are the only ones who can get through to her. It's a woman's world, or should be, and it is great that a Juilliard Project Grant contributed to the funding of this show.